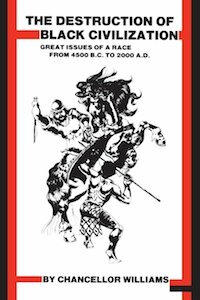 Destruction of Black Civilisation is a widely read classic exposition of the history of Africans on the continent, the people of African descent in the United States and in the diaspora. Destruction of Black Civilisation is a widely read classic exposition of the history of Africans on the continent, the people of African descent in the United States and in the diaspora. This is well researched scholarly work detailing the development of civilisation in Africa and its destruction. This boo attempts to answer the question “Why are black people always on the back foot?”. It is a very strong challenge to the other extremist view of black inferiority. Arguing strongly in favour of black pride and black unity. Despite the charged nature of the discourse, it contains very many facts of African history which are less known and acclaimed, probably because they do not fit in with modern stereotypes of African history, constructed in a nineteenth century that was dominated by “standard” notions of African inferiority. For example, the contributions of early African civilisation to technological advancement, the role of Sudan in Egyptian civilisation, black resistance in Nubia to Arab encroachment. The reader should, however, be warned that this book does not pretend to be a passive account of black history. The author is very proactive and radical in his interpretations; intending the book as a blue print for mobilising the black race against a supposed historical conspiracy by white and arab races to marginalise it.